Here’s a spicy treat and a good way to use up excess mulberries. Any number of commercial rubs work well for the lamb chops, or you can simply use red chilli powder or hot paprika for the rub. Think I may have to substitute pork chops for the lamb chops though. 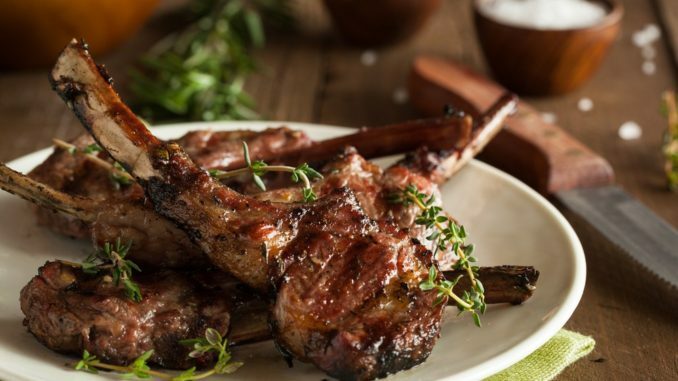 Place the lamb chops on a plate and sprinkle with the rub. Press the rub into the meat and let stand for 1/2 hour. In a bowl, combine the mulberries, melon, chiles, red bell pepper, onion, lemon juice, oil, parsley, and cilantro and mix well. Let stand for 15 minutes. Grill the lamb over a medium hot fire until done; medium rare approximately will take 5 to 6 minutes per side, depending on the heat of the fire and the distance the meat is from it. The internal temperature should be 150 degrees F.
Place the lamb on a plate and top with the salsa.